for as little as $95.00 - Our gift to you!!! PCA Delta is pleased to roll out yet another special offer for our valued customers. This time, we’re giving you the opportunity to boost your business campaign with special printing and finishing effects for your newsletters. 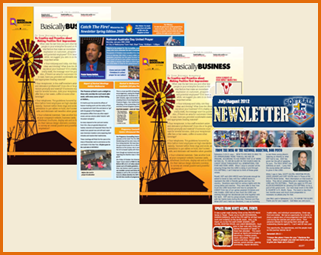 If you’re looking to distribute newsletters that grab the crowd’s attention, then rely on PCA Delta. Our rich, detailed photos, logos and graphics will all add a touch of professionalism to your newsletters- a sure way to catch the eye of your reader. Whether you're sending company newsletters, club newsletters, church bulletins, a non-profit newsletter or announcing a new product release, our experts can help you with your newsletter printing and mailing. Take advantage of this special offer and order your 100 pieces of 11 x 17 newsletters for as little as $95.00- our gift to you. PCA Delta, we make your business look good on Paper!